For Black Friday 2017, Target will be open from 6 p.m. to midnight on Thanksgiving Day, then re-open on Friday at 6 a.m.
On Monday, November 6, customers can get early access to Black Friday sales in stores and online. Target is offering free shipping and returns on online orders until December 23. 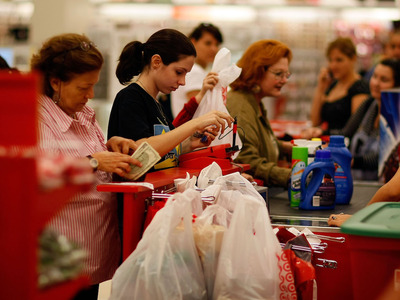 Target is giving its employees a longer break this Black Friday than it has in years past. This year, Target will be open on Thanksgiving from 6 p.m. to midnight, the company revealed on Monday. Then, the retailer is closing from midnight to 6 a.m. Target stores will open again at 6 a.m. on Friday morning, according to an ad first spotted by BestBlackFriday.com. Last year, Target was open from 6 p.m. on Thanksgiving Day to 11 p.m. on Black Friday. Target also announced on Monday that shoppers can get early access to Black Friday deals in stores and online for one day — Monday, November 6. This year, Target will offer a wide range of deals on Target.com. The retailer is providing free shipping and returns from now until December 23.